$5.00 per class; pay at the door - no signup needed! Free class after ten classes taken! Are you ready to party yourself into shape? That's EXACTLY what the Zumba program is all about. It's an exhilarating, effective, easy-to-follow, Latin-inspired, calorie-burning dance fitness party that's moving millions of people toward joy and health. Zumba Fitness® is the only Latin-inspired dance-fitness program that blends red-hot international music, created by Grammy Award-winning producers, and contagious steps to form a "fitness-party" that is downright addictive. Zumba is for all fitness levels and ages. It is all about moving, laughing, and most of all having FUN! You don't have to have the perfect body or be a professional dancer to do Zumba, all you have to do is move and SHAKE IT! 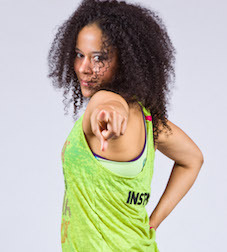 Step out of your comfort zone and join the hottest dance party around... Our instructor April Hilliker has become known as one of the area's best and most popular Zumba instructors. One of the extra attractions of BRT Zumba classes is that April will be teaching from a raised stage allowing everyone in class to more easily see and follow her moves... come down and give it a try! PLEASE PAY WITH CASH AT THE DOOR... no need to call ahead!